There’s a Lady in my Lake! Often when I look at work by other photographers, I get so inspired by where they seem to be shooting. I make the same mistake that most viewers of their work do, thinking that there are ‘perfect’ locations for themed fashion shoots. The truth often is much less glamorous than magazine spreads would have us believe. The real gift of photography is often in elevating the ordinary into something mesmerizing. A while back I was very influenced by the “trash the dress’ phenomenon I’ve seen several of my wedding photography colleagues do. It seemed like such a fun shoot to do! But when I looked closer, I noticed that often the poor bride’s eyeliner and mascara is running all over her face (she looks like she can play drums for Black Sabbath!) her hair is plastered over everything and you can see that the waves are hitting the living love out of the fun couple. This is of course due to the fact that so many of these shoots are inevitably done at sea. The other problem I had with such a shoot, is that it seemed like a fairly silly thing to do. Why on earth would you want to ruin a beautiful wedding dress just for the hell of it? So I decided to take what I like from these shoots and apply it to my own style of shooting. I loved incorporating the outdoor elements into the shoot, as well as the juxtaposition of a beautiful dress in an unexpected setting. I have been fascinated by myths and legends since I was a little girl doing way too much late night reading, and the Lady of the Lake was always a favourite. This in combination with a pre-raphaelite inspired obsession with the Shakespearean character, Ophelia, was to form the concept of an “almost-trashing-the-dress-but-not-quite” shoot. To find a suitable stream, pond or river in a city where the poor model won’t die from toxic exposure to polluted water seemed a very difficult task. We decided to cheat a little bit and bargain a lot on the post-processing, although I generally prefer to shoot correctly from scratch. 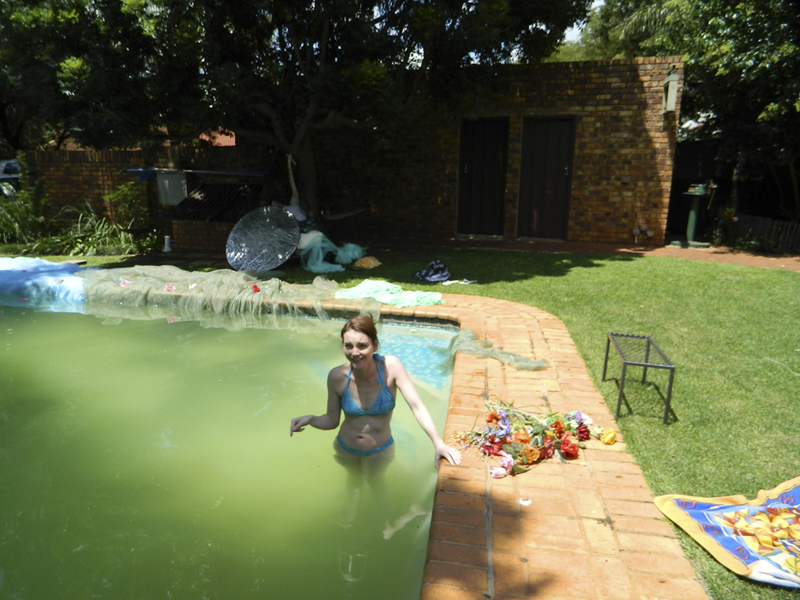 Therefore a pool in a suburban garden had to do as our lake or Ophelia’s tragic final resting place. Unfortunately, my pool was SO dirty, I was really worried about the Loch Ness monster surfacing and carrying the model to the untold (and unclean) fathoms below. Luckily my mother had a pool. Also green, but just green enough to add mood! I started by taking different pictures of the water. This was to be able to layer the water over unwanted objects in my final image, as well as to be able to extend my “lake” past the mosaic and pavement borders of the pool. My mother is an avid gardener, so I also took several shots of plants and greenery, using a macro lens. 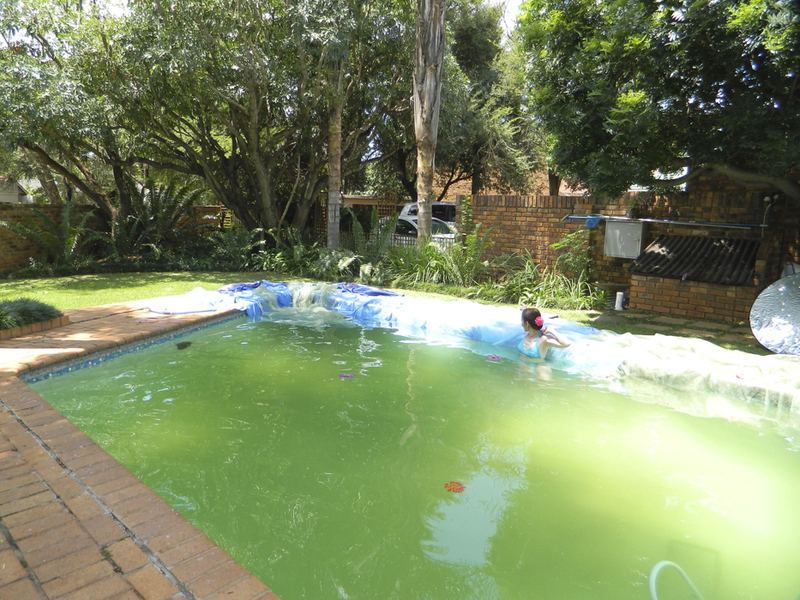 I then covered some of the pool with blue and green fabric and flowers, also to make the layering later in retouching a little easier. 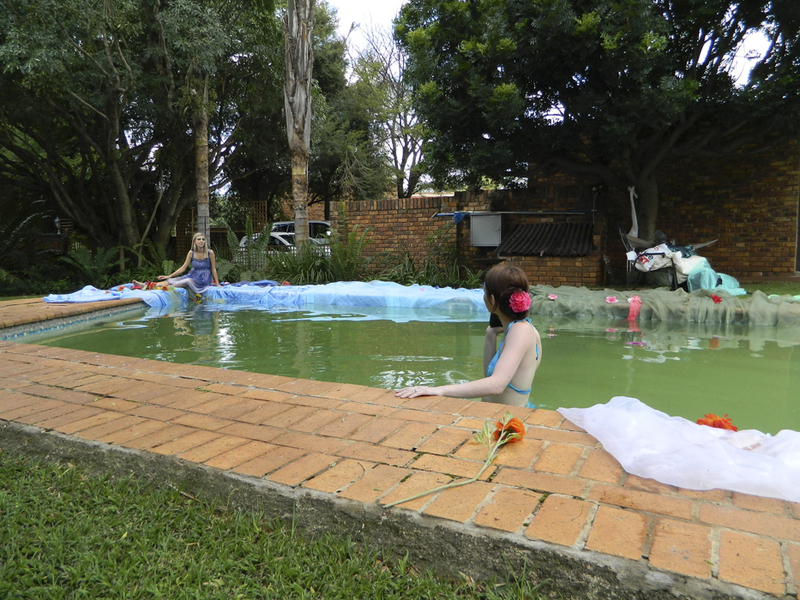 We then used different outfits, props and positioned the model in various areas of the pool. To create the illusion of her “rising” from the depths, we placed a small ladder in the pool at the deep end. Very entertaining since it kept wanting to float! Most of the shots in the end became composite images, with mist layers and other effects added to hide halos or other artifacts, but the “ophelia” images were single images edited with several effects. Here one can see my poor assistant/mother doing her bit. Several drenched outfits are draped over the small chair on the side . . . Taking test shots . In a pool. In a bikini . . . I have found that it is a little difficult for people to take you very seriously if you are “working” in a pool, holding a camera, standing on a floating ladder, in swimwear . . . It makes sense – the model is OUTSIDE the pool, fully dressed. The photographer is IN the pool, in swimwear! I’ve learned that yes, nothing is as it seems when it comes to location. That means that one should keep your eyes and mind open, as there are several places outside of a studio that can be used!